If there’s one thing I spend most of my time on fixing, it’s actually my hair more than that of my make up. I love it like a baby but I definitely have a love-hate relationship with it. Mainly because the way I take care of it is parallel to the way I damage it. But don’t get me wrong, taking care of it is always the goal here, right? But anyway, let’s step aside from fashion and let’s talk about beauty for a change. Actually, this past week, I have set aside my usual hair regimen and tried out this Alterna Haircare Bamboo Smooth Line. I have given quite a vivid introduction of the line in my previous blog post and below are my thoughts of it. I’ve picked up the whole collection, consisting of shampoo, conditioner, treatment oil, and dry oil mist, which are unanimously free from Sodium chloride and Parabens (chemicals which are terrible yet found in 85% of beauty products). After having to use it this past week, I have noticed changes in the texture of my hair. I love how this product lives to its promise of feeling and seeing the difference in just your first use. My hair being damaged and all, it has been really frustrating for me because of it’s unmanageable texture, and also because it’s wavy. After using the products (Shampoo, Conditioner and Dry Oil Mist) on the first use, I have felt my hair became softer and smoother. It has become more manageable for me and saved really time in fixing my hair. Especially when I go to work, I don’t really spend so much time anymore unlike before. But of course, it’s fresh smell gives it plus points. This is really good for frizzy and damaged hair, most especially for the unmanageable ones. Although I haven’t seen any long term results yet, this product has got to be reliable. I highly recommend this of course to all you guys reading this! Though I have yet to try their UV+ line, which is for dyed hair, I have heard from others that this is a bit pricey for your pocket. But I believe that nothing is too pricey for your needs, especially if it provides you with promising results right?! Anyway, the Alterna Haircare Bamboo Smooth line is available at various salons in Dubai and are exclusively distributed in the UAE and the entire Middle East region by Beautylicious Co., WLL. 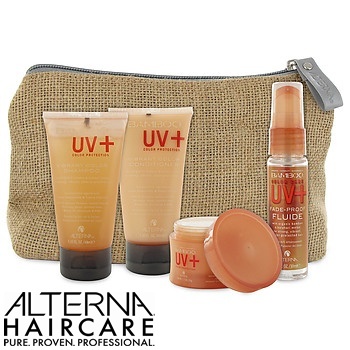 Because they have been really really really generous, they have asked me to share this experience by having me giveaway to one lucky reader the Alterna Haircare UV+ Travel to go kit! This competition is open only to UAE residents who will be able to claim the prize personally in Dubai. Failure to do the mandatory requirements to enter will be disqualified. If you have won, please wait a maximum of 48 hours for me to notify you via email. I’m a style, beauty & travel blogger raised & based in Dubai. Originally from the country with three stars & a sun, The Philippines. Want to stay updated? Subscribe and get an email every time I post something new!